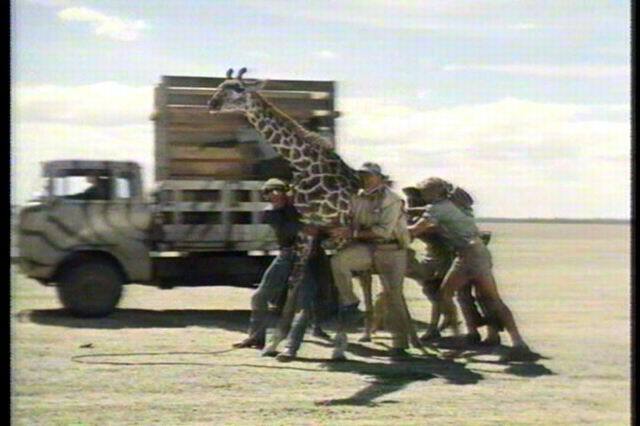 Here's John Wayne and his crew wrestling a Giraffe into a FC-170 Single Rear Wheel Stakebed truck. Here the Dually is fitted with a cage that will eventually have 500 Monkeys in it. Here's the FC Dually pulling up for a second try at catching a Rhino. This FC is equipped with a PTO winch with the stock bumper extended in front of it. Also notice that it came with that exterior rear view mirror that is seen in some of the factory literature. Here's the third FC in the movie. It looks like a blue FC-170 with a box on the back. While chasing a herd of Wildebeest, one of the vehicles, a CJ Jeep rolled when its tire blew out. The animal retrieval vehicle, a FC-170 DRW Stakebed comes to the rescue.